This district lies directly north of the Old City, and it is a much more mixed neighbourhood in the sense that people of all walks of life often mingle in it streets. The quality of the buildings and the wealth of their inhabitants range from the wealthy near the Old City to the poor closer to the Western District. The area is host to both luxurious estates and lowly homes. The North Gate opens to a drawbridge that allows passage to and from the mainland of Faerun. Travelers arriving to Phlan by land do so through this gate and are greeted by the noise and mayhem from the Trading Post Bazaar, and the eerie silence from the gallows in the Hanging Courtyard. 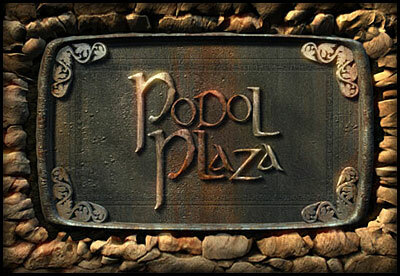 The most important landmark of Podol Plaza is without doubt Kuto's Well. This is little more than a hole in the ground which is said to have played some important role in the history of Phlan and to give access to untold horrors that lurk in the depths beneath the city. The truth is a detachment of watchmen keeps guard at all times and prevents entrance to anyone without a written permit issued by the Council, and most citizens who walk by look warily at the dried well as if expecting something to leap at them from its yawning darkness. Podol Plaza is a rather well guarded district with its own Watchhouse, as required to protect the Bazaar's customers from petty thieves and the North Gate from possible attackers. The area is, however, a bustling hive of activity for criminals led by a group of thieves and small time brigands known collectively as 'The Welcomers'. These felons are surprisingly well regarded by the populace of the city and tolerated by the majority of citizens since they only target foreigners and travelers stopping off to restock their supplies. Even the Watch takes the approach of keeping them under control rather than trying to remove them completely because of their popularity. Also remarkable are the almost mythical Crater of Argulorax, the point where an ancient black dragon is said to have impacted against the ground. 1. Denlor's Tower: This ancient tower houses Phlan’s wizarding guild, and its odd combination of clearly Mulan wizarding staff, combined with the overwhelming Desanea influence (yes, we do mean THAT Desanea, Shal herself), render the Tower the subject of endless rumors as a tool of the Thayans, Tyrrans, both, or neither, depending on what time of the day or night and how drunk the rumor-mongers in question are. 2. Urlen’s Alchemy Shoppe: Located next to Kuto’s Well. Timothy Urlen is getting up there in years. While he sells alchemical products, more and more of his time lately is spent teaching newcomers the basics of herbalism, alchemy, and potion-making in general. 3. The Trading Post. The Plaza itself is dotted with numerous small-time merchants who collectively form The Trading Post. Their prices and wares tend to vary in direct response to Phlan’s fortunes. 4. The Dust to Dust. Kelemvor’s faith is not widely-followed in Phlan, but the ever-looming presence of the Valhingen Cemetery means that its faithful have their work cut out for them. 5. The Dreadlord’s Shrine. Rebuilt after having been burnt during the so-called “Temple War” a couple years back, the Shrine is more imposing than ever, and one of the first things a newcomer arriving from the north sees in Phlan. Banites, of course, like it that way. Everybody else tends to grumble. 6. The Laughing Goblin. Widely considered the best inn in Phlan, it boasts a downstairs which is as comfortable as the Cracked Crown is posh. The upstairs is common-beds like most inns, but there are also tables and desks for those who need to get work done. The owner, Boradak Goblinkicker, is known by those who pay attention to have been an adventurers, and Sot, while famously gracious to the ladies, is basically paid to polish glasses and serve drinks while eavesdropping all day. He’s obviously an agent of (insert your wild drunken theories here). 7. Army of Phlan Headquarters. Currently housed in the Raegar estate for historical reasons (the Army having been reconstituted from House Raegar’s mercenaries), the Army overlooks the Slums Market and regularly deploys soldiers and adventurers both depending on the task needing to be accomplished.